Eicher Trucks & Buses, India’s fourth biggest commercial vehicles player, planning to enter the mini truck segment to compete with Tata Ace. Keeping in mind the growing need for last-mile connectivity in semi-urban and urban India, Eicher Trucks & Buses-Delhi-based company, on Monday launched the Eicher Pro 1049 truck, a 4.9-tonne (gross vehicle weight) in the light commercial vehicles (CV) segment. The 3.5-5 tonne segment has seen strong growth last year with volumes of around 8,000 units in 2015 and, according to Maller, the segment is likely to grow by 20-30 percent in 2016. “Our initial conservative sales estimates are around 2,000 units this year, but I’m sure we will do much better,” he added. Priced between Rs 7-8 lakh (ex-showroom, Maharashtra), for the BS-III and BS-IV variants, the company commands a premium of around 5 percent against established players like the Tata 407 EX pickup and Mahindra’s DI 3200. However, the company justifies the relatively higher pricing by stressing that the best-in-class payload capacity and ‘higher’ fuel efficiency would make the Pro 1049 a more profitable proposition than its competition. Manufactured at the company’s Pithampur plant in Madhya Pradesh, the Pro 1049 is powered by Eicher Motors’ tried-and-tested E483 engine that develops 95bhp of power and 29kgm of torque. 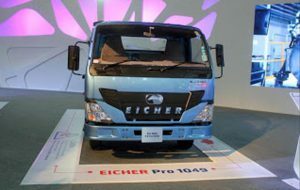 Though it is only available in BS III and BS IV variants as of now, Eicher is also working on a CNG variant of the Pro 1049 for the Delhi-NCR market which, the company says, could be rolled out in the next 3-4 months. In the 3.5- to 6-tonne GVW segment, Tata Motors with its hugely popular 407 has been a long-time market leader with virtually no competition. Now with Eicher Trucks looking to carve out a niche in the sub-5 tonne segment, the competition is set to heat up and will see the market expand with more choices for buyers. tata 407 is a proven leader for longer period amongst consumer it will seen how it grow with sales.